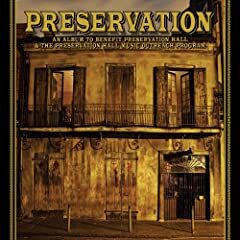 Preservation: An Album To Benefit Preservation Hall & The Preservation Hall Music Outreach Program combines two of my favorite things, great music and a good cause. New Orleans' legendary Preservation Hall jazz Band is accompanied on the album by Tom Waits, Steve Earle, Andrew Bird and others. Sales benefit the Preservation Hall Music Outreach Program, an ongoing program for qualified music students under the age of 18. Ben Sollee and Daniel Martin Moore's Dear Companion is a moving testament against mountaintop removal coal mining from the two talented singer-songwriters. Local Natives' Gorilla Manor may just be my favorite album of the young year so far. Other albums out this week that I can strongly recommend include Adam Green's Minor Love, Boy Eats Drum Machine's Hoop + Wire, and Mumford & Sons' Sigh No More. Comedy fans can pick up Patton Oswalt's 222, which is the unedited version of the performance that yielded his Feelin' Kinda Patton album. Another Patton Oswalt release, the Patton Vs. Alcohol Vs. Zach Vs. Patton EP, collects a 22 minute "drunken insult barrage" between Oswalt and comedian Zach Galifianakis. Reissues of note include several Fela Kuti albums packaged together (Gentleman / Confusion, Koola Lobitos 1964-1968 / The 69 La Sessions, Open & Close / Afrodisiac, Roforofo Fight + 2 Singles) and a reissue of Over the Rhine's Besides.